On a gas water heater, the gas control valve contains the thermostat and pilot light controls. Unlike components of an electric water heater, the gas control valve is entirely outside the water heater, and mounted near the bottom of the unit. Water heater problems that may be caused by the gas control valve include a faulty hot water heater thermostat, non-functional pilot light, tripped heat limiter, and faulty gas valve. Here’s what you need to know about replacing your water heater’s gas control valve. What Does A Water Heater Gas Control Valve Do? The gas inlet connects to the gas control valve, which then, as the name implies, controls the flow of gas to the unit. The gas control valve allows the pilot to be ignited, and the lit pilot heats the thermocouple. Once the water heater thermocouple is heated, it sends a signal to the gas control valve which allows the burner to operate, heating the water in the tank. Along with the thermocouple and thermostat, there is a another device protruding from the control valve that senses when the water is too hot and shuts the valve down to prevent the tank from reaching a critical heat limit and causing serious damages or injuries. Troubleshooting the gas control valve will help you determine whether the valve is faulty, or whether there is a problem with the thermostat, heat limiter, the pilot or even the gas burner. Before you determine that the gas control valve is faulty, check the other components. Gas control valves do not fail often, but it can happen in rare instances. The thermocouple is a more likely culprit, and can be replaced without much expense. If the thermostat or heat limiter have gone bad, you may be able to replace only the faulty component, but it is generally easier and only slightly more expensive to replace the entire gas control valve. Once a heat limiter has been tripped, it must be replaced. However, replacing the heat limiter may not correct the original problem. Even though the limiter can be replaced, it probably indicates a failure in the thermostat or gas control valve as well. WARNING: Natural gas can be extremely dangerous to work with, and the gas should always be turned off before attempting to repair a gas water heater. If you are not comfortable working in such a dangerous environment, contact a qualified contractor. 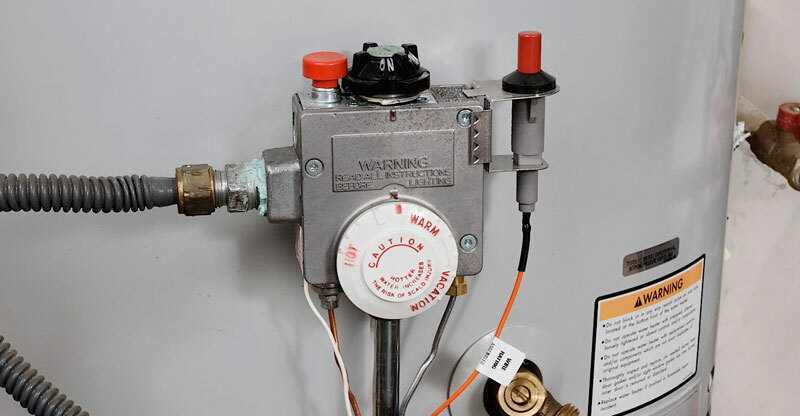 Gas control valve replacement is fairly simple on most water heater models. With the gas turned off, disconnect the lines connected to the gas control valve using an open faced or adjustable wrench. It is important to hold the water heater in place while applying torque to the connectors or you could cause additional damages. Take the original valve with you to the hardware or gas supply store to get a matching replacement. Reconnect the new valve in reverse order. If you do not detect gas or a rotten egg odor, relight the pilot and verify that the water heater is working properly. Newer models may have wires connected to the gas control valve. These wires are connected to a thermal fuse in the burner compartment that will turn off the gas to the water heater in the event of a flash fire. If these wires are present, they are important and must be reinstalled when the valve is replaced. Again, contact a professional plumber if you don’t feel 100% comfortable with any part of the gas control valve replacement process. How to remove a broken gas control valve?